Disability Studies and Spanish Culture is the first book to apply the tenets of Disability Studies to the Spanish context. In particular, this work is an important corrective to existing cultural studies of disability in Spain that tend to largely ignore intellectual disabilities. Taking on the representation of Down syndrome, autism, alexia/agnosia as well as childhood disability, its chapters combine close readings of a number of Spanish cultural products (films, novels, the comic/graphic novel and the public exhibition) with a broader socio-cultural take on the state of disability in Spain. Fraser is just as comfortable with the work of disability theorists who advocate a social model of disability (such as Lennard J. Davis, Licia Carlson, Eva Feder Kittay, David T. Mitchell, Sharon L. Snyder and more) as he is with the analysis of film and literature in the Spanish context. While researchers and students of cinema will be particularly interested in the book’s detailed analyses of the formal aspects of the films, comics, and novels discussed, readers from backgrounds in history, political science and sociology will all be able to appreciate discussions of contemporary legislation, advocacy groups, cultural perceptions, models of social integration and more. The book is directed, also, toward those readers more familiar with the growing field of Disability Studies itself—making the argument that the specific case of Spanish culture and society speaks to shifts in the social attitudes and theoretical understandings of disability more broadly considered. An Open Access edition of this work is available on the OAPEN Library. 1. This is the first book to look at Spanish culture through the lens of Disability Studies. 2. It emphasizes films and novels from 2004 to 2010. 3. It focuses on intellectual disabilities (Down syndrome, autism, alexia/agnosia…). 4. It features a chapter on a recent comic/graphic novel. 5. A brief epilogue discusses art produced by people with intellectual disabilities in Madrid. 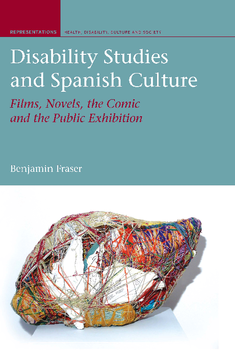 Dr Benjamin Fraser is Assistant Professor of Spanish Film and Cultural Studies at the College of Charleston (USA).